One bedroom apartment is for sale, fully furnished in Sunny Beach, Sunny Day 3 complex, Bulgaria only for 26 900 euros. 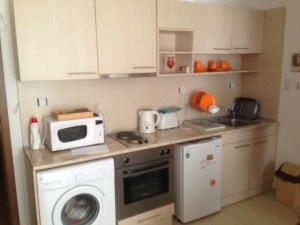 Great apartment in the central part of Sunny Beach is for sale. The apartment is located in a residential complex just about 10 minutes walk from the beach and the sea. Available to the quests are an outdoor pool with children's section, sun loungers, coffee-bar to the pool. This is a pleasant environment to spend a wonderful family vacation. There are many shops, restaurants, cafes, disco. Aqua Park Sunny Beach is only 5 minutes by car. Another ten minutes will take you to the old town of Nessebar, where you will feel the charm of the old days. The apartment offers one bedroom with double bed, wardrobe and dressing table. There is spacious living room with comfortable sofas, coffee table and cable TV. The couch is extensible and two more people can sleep on it. The kitchen is small but well equipped with oven, hob, fridge, washing machine. The living room leads to a small balcony overlooking the pool. The apartment extends to 44 sq. m of living area located about 700 m from the sea. It is fully furnished. The annual fee for maintenance is 480 euros.